By the time I was able to make the trip to Minneapolis to work with the Bun, his movement had been impaired for just over a year. His human companions, Mia and Paul, were not sure what had happened, but Bun had suddenly been unable to use his left hind leg, which after several months had begun to atrophy. Bun had allowed me to work with him several years before when he had somehow strained his back (he and his human, Mia, had formerly been my neighbors in Chicago), so while he was a bit wary, being a bun, he was nevertheless willing to give me a chance. Because I was spending the weekend in Minneapolis working with horses, I planned on working with Bun on three consecutive days. Because he was a bun, and not thrilled about being excessively handled, we kept the sessions short, about 20 minutes apiece. In our first session, late on the evening of my arrival, I sat on the living room floor with Bun and began with gentle touching, using only my fingertips. My intent was merely to bring Bun’s awareness to his body. His movement had been severely diminished for a long time, and I wanted to reintroduce him to his body parts and their ability to move. I outlined each vertebra of his spine, gently pushed his tailbone towards his head to remind him how his hind end connected to his fore, outlined his ribs, and gently moved his sternum (or breastbone) from side to side, all with the tips of my fingers. I would have liked to work with Bun’s feet as well, but he would not allow it. At the end of the session, Bun still had his left hind leg tucked up under him, but he seemed much more alert and energized when Mia returned him to his area in the dining room where his bed and food were and where he now spent much of his time. The next morning, I worked with Bun again before I left for the day. This session was similar to the first one, in that I was still attempting to bring Bun’s awareness to his body, but this time I wanted to bring his awareness to a slightly deeper level. Once again, I used my fingertips to I gently outline his spine and gently push his tailbone towards his head. But this time, instead of outlining his ribs, I gently lifted his ribcage, one side at a time, to show him that it was capable of movement and to show him the connection between his ribs and spine. And this time, when I touched his sternum, I used both hands—one hand on the point of his sternum, one hand underneath his body, directly behind his front legs. I gently, slowly moved his sternum back, forward, and from side to side, again to show him that movement in this area was possible and pleasurable, and to show him the relationship between his sternum, ribs, and spine. Bun listened attentively to this lesson. When he appeared to have had enough, Mia took him back to his area in the dining room. Late that evening, when I returned from working with horses, I decided to work with Bun again. I was leaving the next day and wanted to work with him as many times as I could in the short time we had. I felt that the way to make the best use of our time together without overloading his nervous system with too much information was to do more frequent, shorter sessions. I began our third session by sitting on the floor and placing Bun between my outstretched legs. In previous sessions, I had worked on my knees, bent over him. But now, I wanted to offer him a secure, enclosed space, as I was going to work at a deeper level than the previous sessions. My intent in this session was to prepare Bun’s body and nervous system for standing on all four feet. Once again, I worked with Bun’s sternum. I used both hands to slide it from back to front to back to front. My touch was gentle, but I asked the sternum to move more fully than I had before. As I eased the sternum back towards his tail with one hand, I used my other hand, which was under his belly, to gently lift him onto his feet. As I eased the sternum towards his head, I gently set him back down. After showing Bun this rhythmic movement a few times, I began alternating it with gentle pushes through the pelvis—first one side, then the other—and the sternum. I still had one hand underneath him, offering him support, and now I was raising him completely off the ground to prepare his nervous system for standing. At first, he was alarmed when his feet left the ground; Mia pointed out to me that his eyes were beginning to bulge. But he did not try to escape or bite, so I gently continued with my work. I then set Bun back on the ground and began working with his right hind leg. Remember, it was the left hind that was giving Bun problems. But I wanted to bring to Bun’s attention to how smoothly and efficiently a hind leg can work, and so to do this I worked with the one that already worked most efficiently. I placed the flat of my hand underneath his right hind foot, creating an artificial floor. Unlike an actual floor, my hand could move. And so with his tiny foot on my palm, I slowly rotated my hand at the wrist, causing the “floor” to slant in this direction and that, bringing Bun’s awareness to the flexibility of his foot and each of his toes. I then played with Bun’s leg, gently and very slowly showing him the range of motion he had available in the leg and hip. Bun was very quiet as we worked, clearly listening to the information I was sharing with him. Finally, I was ready to touch the left hind, the leg that Bun had kept tucked up under him for so long. I gently touched his toes, one at a time, showing him that the foot was not an unyielding block, that it was flexible. His foot spasmed momentarily, then released and softened. As I had done with the right foot, I now played the artificial floor game with the left foot and then showed Bun the range of motion he had available in this leg and hip. As I worked with Bun, as his body softened, I became more and more convinced that the injury he had sustained was not to the leg itself but to the nervous system, that he had suffered a mild stroke. And so at this point, I decided to play a trick on his nervous system. I eased one hand under his belly to support him and to lift him to his feet, then with the other hand I gently crossed his left hind leg over his midline-the imaginary line running vertically through the middle of the body. I had already shown him that his right hind leg was fully functional. Now I wanted to trick his nervous system into thinking that the left hind was in fact the right hind. To do this all I had to do was move the left leg to the right side. I had no expectations at this point. I merely wanted to give Bun this information. I still had one more day to work with him before I had to leave, and I planned on continuing our dialog the following morning. But, incredibly smart creature that he was, Bun only needed to be told once. Moments after I crossed his left hind leg over the midline, Bun jumped off my hand, shook himself, and hopped—using all four feet—into the next room. I started laughing, Mia started crying, and Bun no doubt wondered what all the fuss was about. The next morning, I decided not to give Bun another session. I felt his nervous system had received enough information over the previous two days and that he needed to be allowed to integrate it. I sat near him while he ate his breakfast and gently stroked him a few times. Then I showed Mia a few ways she could work with Bun until I could return to Minneapolis several months later. I did not get another chance to work with him. Two weeks after my visit, Bun died of natural causes. Mia assures me that his last two weeks were good ones, that Bun was able to hop around the house and that one day he even scratched his face with his left hind foot, something she had not seen him do for over a year. I am forever grateful for that, and that I had a chance to work with this intelligent and gentle creature before it was time for him to leave. 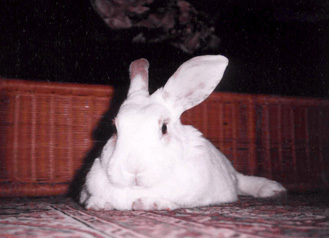 My wonderful house rabbit, the Bun, had always had full run of the house with no problems. As he got older, he had some troubles negotiating the hardwood floors, but other than that he never had any trouble getting around. Then one day in his eighth year, my husband and I came home to find Bun unable to use his left hind leg well at all. It wasn’t paralyzed—he just seemed unable to keep it from slipping underneath him. A trip to the emergency room X-ray machine revealed no breaks, thank goodness, but we were not given much to work with in terms of recovery or even how to keep him comfortable. We tried acupuncture for awhile but did not notice any significant improvement. I had known about Pam’s work for several years; she had helped Bun once before, and I thought she would be able to help him again. The problem was that Pam, who is based in the Chicagoland area, was two states away, with a schedule that wouldn’t allow her to come to us. Finally, more than a year after Bun’s injury, Pam was able to make the trip to Minneapolis. At this point, Bun was nearly 10 and his left hind leg had atrophied quite a bit. He was finding it harder and harder to get around. We had always kept him in a safe area after his “incident,” but his world was getting smaller every day. Throughout it all, he remained his sweet, affectionate self, with no intentions whatsoever of letting a little thing like a bum leg get him down. Finally, Pam and the Bun got to work together. They worked two days in a row, in three sessions of about 15 to 20 minutes. Pam sat on the floor with him and showed his body that the left hind leg was still there and could still work for him. Through her work with him, we concluded that what had happened was probably a neurological episode, such as a stroke, but we will never really know. In the first session, Pam slowly introduced her work to the Bun with gentle touching and very subtle movements, using only one finger. Bun was a little dubious, but cooperative. By the second session, Pam seemed able to work a little more directly with the Bun, and he was definitely listening to what she was telling him. Their third session was very interesting; Pam was able to use both her hands on Bun and really “have a conversation.” I could tell that Bun was very engaged in what was happening. And then, without warning, Bun jumped out of Pam’s lap and hopped into the next room—using his left hind leg, unassisted! Pam showed me a few exercises I could do with the Bun to support her work between visits, which included all over, gentle touching and creating a false floor for him with my hands under his feet as he re-learned how to move efficiently. My beloved Bun could make it from one spot in the house to another, with no assistance. He began sitting in places he hadn’t been in over a year. It was amazing and gratifying to see him able to use his body again. Sadly, Bun died two weeks later, of natural causes. He will always be missed, and always be remembered. I thank him every day for showing me how incredibly intelligent the body is and how easily it can be taught to heal itself.